‘Ninja01’, a redoubtable member of the Seikoholics forum kindly contacted me about the Diamond Flake movement and the difference between the donor movement I’ve used to resolve the problem with my Diamond Flake. Ninja01 is a Seiko expert and told me that the Gold Feather model had at least two movement variants with differences in their architecture, so could this apply to the Diamond Flake? Since I was concerned that my donor movement, although running well, might have been fixed in a non-original way I thought I’d dig a little deeper. I hoped that this would also confirm Marko’s view and reassurance that all is well! 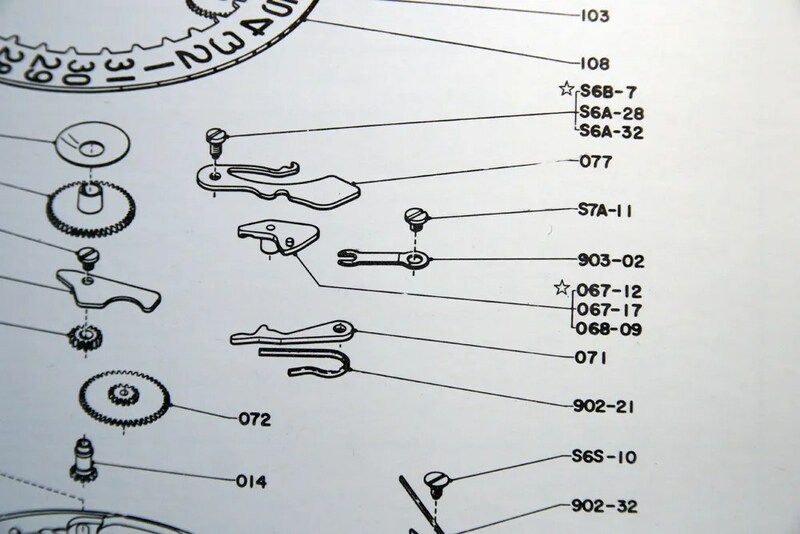 First I checked my photo of the two movements and noticed that not only did the donor movement have a different top lever, but it was also missing a part held by a screw underneath it. So it is more than the top lever that is different. 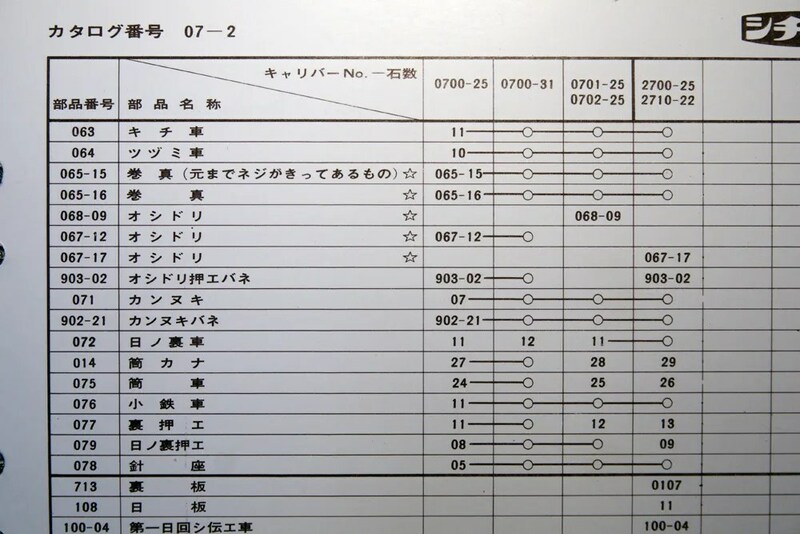 I soon found, via Ranfft’s archive, that there were several movement numbers for the Diamond Flake, from 0700 to 0705, but no differences are identified. 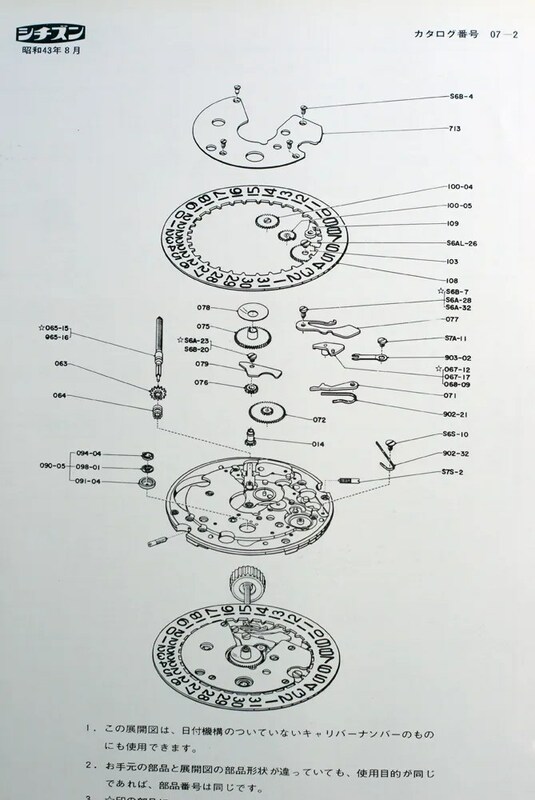 NB: the parts diagram shows a date wheel, this is for the 2700 Diamond Flake Date and the 2710 Date Flake models. 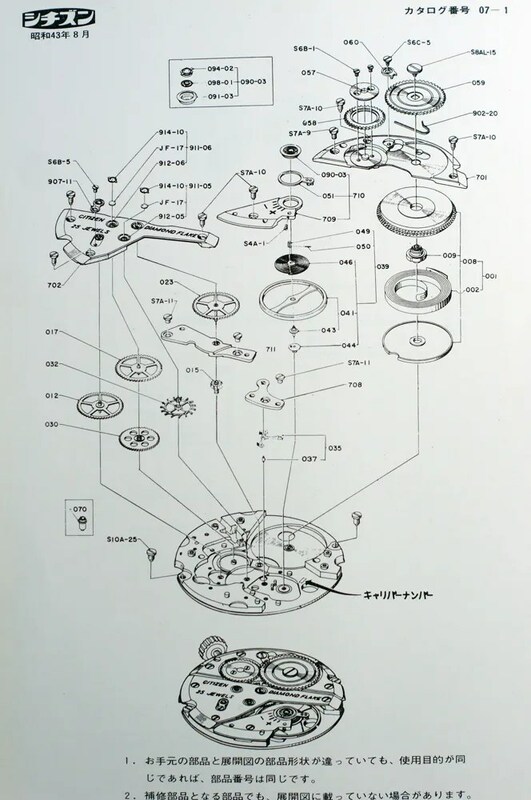 Hi, please where can i find the technical description (cross section..) about the 0700 movement ? I keep in safe place this info..
Hi Stephen, sorry for bother you again..
my diamond flake have a problem (go backward 20 minute a day ) and my watchsmith said that the problem is the parashock system part n°090-05 and specifically the part 094-04 if i have correctly understand..
do you know if the deluxe have the same part ? because i have a deluxe donor watch. good news from you !